The ocean was calling for me, so I flew to the Azores to dive into some marine research. Truly the Hawaii of Europe! Fresh off the plane back from the Azorean island of Faial, I’m already missing the feeling of sea breezes and view of waves in the distance. I’ve always had a soft spot for “Island life,” the feeling of being on a self-contained floating town in the middle of the ocean, much more open to the elements, and without the need to forcibly rush everywhere. 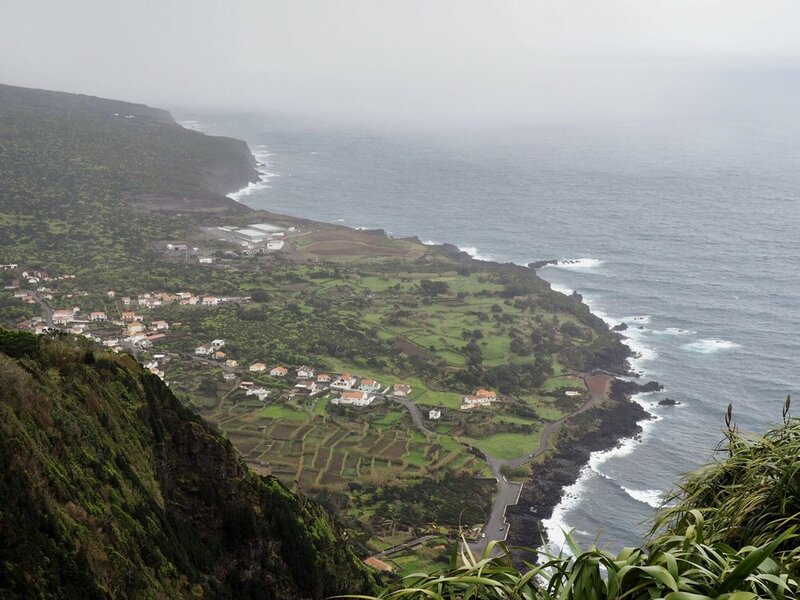 And so I went to the Hawaii of Portugal to the town of Horta for 9 days to volunteer with the local group Naturalist, which was started by some real-life Cousteaus/ marine biological researchers (Gisela & Jose,) who work very hard to show visitors the beauty of the seas and the natural land. The Naturalist whole team welcomed me very warmly, and I felt so lucky to spend time with the whole group. View of Faial/ paradise, complete with rainbow! While there were other research projects taking place focussed on marine litter, and the effects of climate change on cetaceans, the primary research I assisted on was the Portuguese Man of War (Physalia physalis) project. Man of War are not actually jellyfish - but a colony of polyps/ organisms, that work together to create a functional organism. They are very colorful, crazy, and a little scary. Some of the highlights of my time in the Azores were on the Naturalist whale watching/ research vessel, where we bounded over the boisterous Atlantic waves between islands in the rubbery Zodiac, like a professional "Zissou" crew. Once we were truly soaked in splash, and quaking in our seats, we looked towards the "blow" of far off cetaceans, hoping for some sort of connection with the ocean giants, before their fluke splashed, signaling the whale's descent to greater depths. It was truly exciting (and physically exhausting!) for all, as we rocketed over the waves on our rubber rollercoaster, hoping for a lucky chance. But it wasn’t all luck -- as Spotters on shore peered from their binoculars at the sea, locating any whales before we hit the water, upping our chances of finding whales. Viewing some lava tubes on our rubbery Zodiac! The most common whales off Faial are Sperm whales/ Cachalotes, which were (quite recently!) hunted for their oil off these same islands until 1984, and now still dare to swim by. Locally, they are often females with juveniles, and are wonderful to see with their single nostril left-slanted blow, and massive heads bobbing through the waves. A juvenile sperm whale attempting a dive! I also had a lovely one-day visit to Pico island, (only 30-mins away by ferry!) with the wonderful Tripix team. There, I spent some time in the local Whaling Museum, which was fascinating but also truly shocking; I’d grown up going to Whaling museums in the USA, but this was a much more recent wave of whaling, so rather than just ancient etchings of the trade, there were full-color photographs of the whole brutal process of carving up an entire sperm whale. And while I understand the past need for the practice in these communities, it still stuns me to see it in the recent light of day... Hopefully we can move away from this activity permanently! Other notable species in the Azorean waters were the three resident dolphin populations: the small common, grey-scratched Grampo/ Risso’s, and huge Bottlenose; the dolphins often punctuated our boat trips with cheerful jumps and elegant wave cuts. My particular favorite were the Grampo, as they looked similar to dreamy Belugas, (with their ball-shaped heads,) and moved slow enough for us to really have a good look at them. The common dolphin, whipping through the waves! It was still hugely exciting, and definitely caught my breath watching it; particularly as right after we saw a Fin whale, which is often just as large, but a much speedier creature, built like a torpedo to zip under the waves. Find out more about Naturalist here. Dock to Dish 2.0: Kickstarter Launch! I was lucky enough to write an piece for Edible about Dock to Dish's exciting Kickstarter launch! Here's a snippet! A snippet of the piece I wrote for Edible Brooklyn! Valentines Nights for you & your Sustainable Sweetheart! The hunt is on for the ultimate romantic night for you & your sweetheart this February! And what better way to celebrate your love than in a wonderful feast of sustainable seafood?! Santa Claws' Holiday Gift Guide! Last week I was lucky enough to take part in an exceptionally inspiring week in NYC: Sustainable Seafood week! Taken on by the SSW team as their social media maven (@iloveseafoodnyc !) and official photographer for the events all week, I was spoiled rotten. With experiences ranging from decadent cooking classes, to quiz nights and special dinners, it was a delight for the senses, especially for a sustainable seafood nerd like me. After such an immersive week with such inspiring sustainable-fish-positive people, I just had to share some of the highlights of my week! I was fortunate to visit a number of remarkable restaurants this past week, all happily promoting sustainable seafood. Out of all the restaurants I visited, a few stood out from the crowd for their great cuisine and friendly staff, particularly Blue Water Grill and Northern Spy. However, there was one restaurant that stood out from the rest. The only Monterey Bay Seafood watch-approved restaurant in NYC, Crave Fishbar is one of a kind. It feels fresh and new, and very forward thinking. And- I must say- their interiors look like something out of "The Life Aquatic." So, it makes sense that I would love it. And- to top it off- their food is GREAT. Serving up a wide range of cuisine, from traditional Mussels Provencal, to zesty Thai lobster curry, and Oysters with a refreshing wedge of grapefruit among a cornucopia of citrus toppings, it was a fantastic experience, and I encourage you to try it! And Crave Fishbar likes to “carry it forwards” too! Crave’s head Chef Todd Mitgang, in partnership with Camilla Abder from Sea to Table, and Sean Dixon of Village Fishmongers, together taught a brilliant class at the Natural Gourmet Institute. It brought together a wonderful assortment of skills, from sourcing and preparing your sustainable species (pick Porgy! ), how to an oyster, and how to cooking a masterpiece mussel meal, simply from butter, white wine and a bag of fresh mussels. It was a simple and satisfying education, and I cannot wait to use the lessons in my own kitchen soon! Now, many of you might not believe this, but before this evening at Brooklyn Oenology, I had never before tasted real sushi. I mean the “good stuff”-- truly decadent raw-fish-topped sushi. And goodness-- have I tried it now! Mayanoki is a fully sustainably-sourced pop-up sushi restaurant that serves traditional multi-course omakase dinners, complete with the charming sushi chef host! We were lucky to have Chef Yoshi all the way from Nebraska (which could not be further from the sea!) and he definitely knew how to handle his fish. All seafood from the dinner was sourced from Greenpoint Fish & Lobster, and was carefully sliced, diced and pressed into delicious little mouthfuls. While everything was overwhelming new for me-- and let me say, I was truly apprehensive at the start-- I did enjoy some fantastic fish flavors. My favorite was the “charred” Arctic char, paired along with sustainably farmed Alaskan Salmon. It was delicate, flavorful, and tasty. The strangest thing I tasted- which I really wish I had not googled before heading to the table- was the rather daunting Geoduck… See its horror here. It was mild, but a little chewy for my satisfaction. And I hate to say it- but my least favorite thing I tasted were actually two of the species I hold up most highly for their health benefits and sustainability choices: the mackerel and the sardine. I think they were just a bit too… overwhelmingly fishy for virgin fish palate. However, I will definitely try them again! Much to my delight: one of my long-time local NY fish conservation heroes- author Paul Greenberg- also hosted an event this week! The event was in conjunction with the release of his latest book “American Catch,” which covers America’s strange issues with actually eating seafood caught from American Waters-- you might be shocked to know that 91% of seafood we eat in the USA is imported! With the help of Chef Kerry Heffernan, Paul led a charming lunch on the stunning Grand Banks docked sailboat-come-oyster-bar-dining ship. The tasting was focussed on revealing the tastiness of often over-looked species: Bait fish! I was blown away by the culinary cleverness that met my plate: commonly unpopular fish, often overlooked at the end of the line, were paired with more popular fish that these bait fish were often used to catch! For example, a herring dish was topped with a simple lobster sauce. The butterfish dish was served with a tonnato (tuna) sauce. It was a brilliant juxtaposition to encourage new tastes, and to promote the less popular fish into a new, delicious light! And I encourage you to check out “American Catch” now- it’s a charming read on a very important topic! Big thanks to everyone involved for a great week!! Take a chance and DIG IN at one of the restaurant partners from SSW, and Bon Appetit! Today, I ripped off an age-old band-aid, and had my very first, very juicy, salty and citrusy oyster. Growing up with a deathly-oyster-allergic mother, and in a city no where close enough to the sea to really experiment, oysters were never really a temptation during my youth. They seemed mysterious and slimy, while also intriguing as little elixers of life. Now living in New York City, where Oyster-fever is booming heavily these days, my enthusiasm for the little shelled critters has grown, especially encouraged by a couple oyster-positive situations. First off, many of my favorite spots where I love to grab a classy cocktail or two have started serving oysters- and really only oysters- or bread and butter. And while I love bread and butter, especially with flaky sea salt and a hint of seaweed, that’s not REALLY dinner. The other great development that has evolved is the sustainable seafood movement in the City, which is truly one of the big driving forces for my starting this project. And the cherry on the cake: oysters are being toted as one of the Happiest Fisheries around! In truth, Oysters are magical for many reasons. They are filter-feeders, and can clean vast quantities of water at great speed- up to 20 gallons of water a day! In fact, there’s a project going on right now called the “Billion Oyster Project,” whose team is working with NYC public schools to restore NY Harbor one oyster at a time. As they plant oysters all along NY waterway, their goal is to plant 1 billion oysters over the next 20 years. With 11 million of these little guys already planted, the cleaning progress of the waterways has been noticed: the “black, anoxic mayonnaise” of the sea bottom is already improving. But, these aren’t “eating” oysters: for now, they are simply little cleaners of the ecosystem. Which is so cool. Think what this could do for NY waterways in the future! Oysters are also very sustainable. In general, shellfish (mussels, clams & oysters) are one of the world’s most sustainable forms of protein in the world. They are cultivated with a very low impact on the ecosystem. Unlike other forms of aquaculture, oysters do not require fish meal, and are self-sustaining, feeding on tiny particulate matter from the sea itself. On top of this, oyster farms don’t have the problems of waste run-off, as they are literally cleaning the water. They are also very traceable- just like a Beanie Baby, each bag of oysters is tagged with its origin, distributor and harvest date. They are also truly nutritious, packed full of zinc, minerals and vitamins. After absorbing all this oyster-positive information, I was ready for the big Taste. In my opinion, it was less of a taste, and more of a Texture. The first oyster, I made the mistake of not chewing, and the slimy little guy just slid down my throat, leaving a trail of lemon juice and not much else. For the second, my friend and oyster-coach decided I should have a little chew. So I took another little shell, gently dipped it into my mouth, and had few chews. With this new technique, both the flavor and texture improved, and I was encouraged to keep on swallowing! My face might mislead you- but I did enjoy the little oceanic treats. Now: your turn. Go eat some Oysters! When you’re picking oysters, I think both Wild and Farmed oysters are good choices. At this point, 80% of the wild oyster populations have been wiped out, and 95% of the oysters in the market are farmed.